A mountain resort that is anything but roughing it, Solara Resort & Spa provides a host of amenities in the heart of the Canadian Rockies. 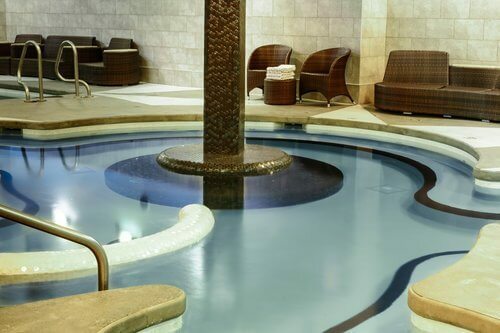 Indulge in pampering spa treatments at our full-service spa facility - One Wellness & Spa. Hit the state-of-the-art fitness centre for a great workout with cardio machines and weight equipment. Whether your trip is designed to be a relaxing retreat, elegant corporate conference or an upscale family vacation, the perfect place to enjoy it all is from the luxury lodge ambiance of Solara Resort & Spa. Canmore's only movie theatre is available exclusively to guests of Solara Resort. Complimentary movies are shown nightly (based on theatre availability). See front desk for today's feature! Solara features a newly renovated large indoor hot tub and cool relaxation pool. Your stay also supports local eco-friendly initiatives to better our community. Hit the fitness centre to get in an invigorating workout at the incredible fitness centre at One Wellness & Spa. Or, hit the great outdoors to take advantage of a wealth of recreational options at the resort, including complimentary bicycle rentals (seasonal, based on availability), hiking trails, mountain biking, and running paths. There's a special games and activities room that the little ones will love. Solara offers more than 5,000 square feet of elegant events space which can be custom configured for meetings, awards dinners, conferences, weddings, parties, and family celebrations, and much more. High-end audio visual equipment with surround sound, and complimentary high-speed wireless connectivity are available throughout all of our function spaces. The Aurora Theatre seats 96 people and is perfect for speaker series, movie nights, and presentations. The retractable seating allows for multiple configurations transforming it into the perfect meeting space for smaller groups. Solara Resort is not universally wheelchair-accessible; please contact the property directly to inquire about potential limitations. Bring your furry friend with you to enjoy your luxurious home away from home at Solara Resort & Spa. Solara Resort & Spa is pleased to welcome pets in select units. Be sure to request one of our pet friendly suites when you make your reservation. In order to best accommodate you and your pet, please indicate when you make your reservation, that you require a "Pet Friendly" room. Additional Pet Policies: Noise from pets must not interrupt the quiet enjoyment of other guests at the resort. Pets must be kenneled if left unattended in a suite, housekeeping services will not be provided if pets are unsecured. Food and water bowls are available upon request by calling Guest Services by dialing "0". The owner of the pet accepts full responsibility for any damage or harm caused by their pet while on resort premises. All pet waste must be picked up immediately by the pet owner and disposed of in a waste container (failure to pick up after a pet may result in the eviction of the pet or additional housekeeping fees being charged to the pet owner). Pets exhibiting aggressive behavior towards other pets or guests will be asked to vacate the resort. Non pet friendly suites found to have unregistered pets will be subject to additional cleaning fees.